A golf vacation in the Emerald Isle planned by CORK & TEE is certain to enchant you. 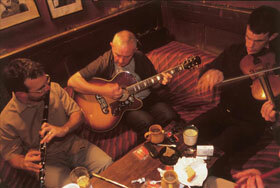 There is a very lyric quality to Ireland that seems to fit this special place like a glove—not just in its traditional music, but in the lilting dialects you will hear across this island nation. Let us expose you to the palpable spirit of Ireland—from its friendly people and stunning scenery and golf venues to remarkable cuisine and a variety of libations that you will not soon forget. 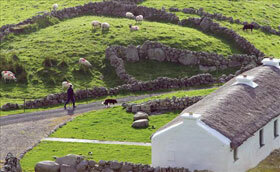 We recommend two different general itineraries for CORK & TEE Ireland golf vacation adventures. The first focuses on the east and northeast with bases in Dublin and in the Antrim area, while the second focuses on the beautiful west and southwest, home to Waterville, Old Head, Lahinch and Ballybunion, among other courses. Working with our affiliate partner, who has 25 years experience developing Ireland golf itineraries for discriminating travelers, we will design the most appropriate itinerary to suit your needs. Golf options in Ireland are quiet varied. 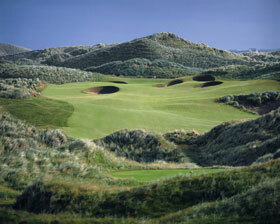 In Northern Ireland, just an hour from Belfast, awaits historic Royal Portrush. Founded in 1888 as the Country Club, it is known as the only course in Ireland and Northern Ireland ever to host the British Open. Many believe that RP is one of the finest links courses anywhere, though the higher-handicapper should beware—the plush rough on this demanding track devours more than its share of golf balls. Also in Northern Ireland is Royal County Down, which simply is a “must play.” This is a breathtaking Northern Ireland experience, no matter the company or the weather—and beware; the elements can be diabolical here. Royal County Down is one of those rare works of art that feels as if it were “discovered” in the countryside, in stark contrast to some modern courses that are “fashioned” by bulldozers and a high-dollar architect. Magnificent. One of the southwest’s must play courses is County Kerry’s Waterville, a relative infant in the realm of Irish golf. Built in 1973 by Eddie Hackett and gradually tweaked since 1987 by Tom Doak, Waterville is an extremely versatile course, combining the sheer enjoyment afforded by more typical resort venues with the consistent and straightforward challenge found in courses worthy of hosting a major championship. Thanks in part to a booming economy, the Irish culinary scene rates among the very finest in Europe. Today’s Irish chefs are well traveled and are putting a contemporary stamp on staples such as fish and shellfish, organic meats, regional cheeses and high-quality local produce. 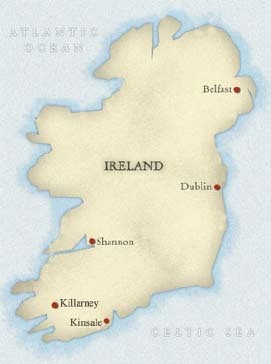 We will help you learn more about New Irish Cuisine. We also can help you navigate the best of Dublin's 800 pubs and tour the Guinness Storehouse, capped off by one of the finest views of the city. Perhaps a visit to the Bushmills distillery will figure into your itinerary. Wherever your itinerary takes you, our drivers will know just where to stop in the countryside to suit your group's preferences. Together we can choose from among world class accommodations, ranging from newly-restored Dublin landmarks to memorable inns, country house hotels, castles and manors in the spectacular Irish countryside where a roaring fire, a friendly smile and maybe even a rainbow will greet you at the end of every day.